Amazon lifted the cover of the second-generation Kindle Oasis ebook reader – and now this premium device is actually a good device as well! 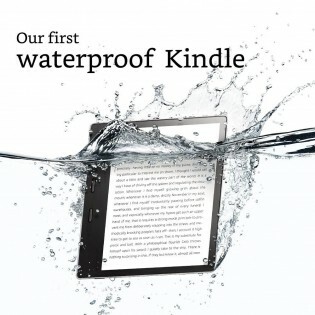 Seriously, it’s now waterproof to live up to its name and has a bigger screen to boot. The new model has a 7” screen (up from 6”) but keeps the 300ppi pixel density. It has three times more LEDs to light up the screen than the regular Paperwhite for a bright, even illumination. That’s two more LEDs than the original Oasis (12 vs 10). The aluminum back and soft touch plastic on the front and sealed tight, the 2nd gen Oasis can survive under 2m of water for an hour. And not just water, Amazon tested it in hot tubs and bubble baths. Also, gone is the silly battery pack cover from thee original, the battery capacity has been increased without making the 3.4mm body any thicker. You can still have a cover to protect the screen and serve as a kickstand. 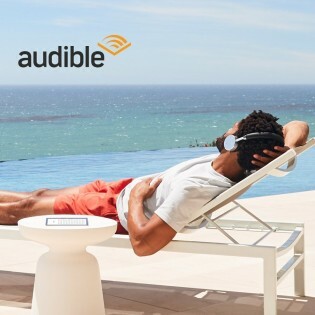 There’s more good news – Audible is now built in. No, Amazon didn’t resurrect the speaker or 3.5mm headphone jack that the QWERTY Kindles had. Instead, you can stream audiobooks to Bluetooth headphones and speakers. To accommodate audiobooks (which take up more space), the Kindle Oasis 2nd gen comes with 8GB of storage. There’s a 32GB version too, if you expect storage to be a problem (e.g. if you consume many audiobooks and graphic novels). All of this sounds great and it gets better – Amazon cut the price to $250 (down from $290). The extra storage costs $50 more. There’s a model with LTE connectivity as well, which comes only in 32GB and without special offers. The new Kindle Oasis will be available from October 31 in the US. There’s no launch or pricing info for Europe yet.